MiaE is a hydroxylase responsible for introducing posttranscriptional modification in position 37 in tRNA. The hydroxylation of the i6 group leads to appearance of hypermodification N6-(cis-4-hydroxyi-sopentenyl)-2-thiomethyladenosine (ms2io6A, also called 2-methyltio-cis- ribozeatin) and this process is dependent on the presence of the molecular oxygen (O2). For MiaE, we confidently predict that it shares the three-dimensional fold with the ferritin- like four-helix bundle proteins and that it has a similar active site and mechanism of action to diiron carboxylate enzymes, in particular, methane monooxygenase (E.C.1.14.13.25) that catalyses the biological hydroxylation of alkanes. The crystal structure of PpMiaE (Pseudomonas putida) was published  giving us a possibility for direct comparison of our model of StMiaE (Salmonella typhimurium)  with the native structure. 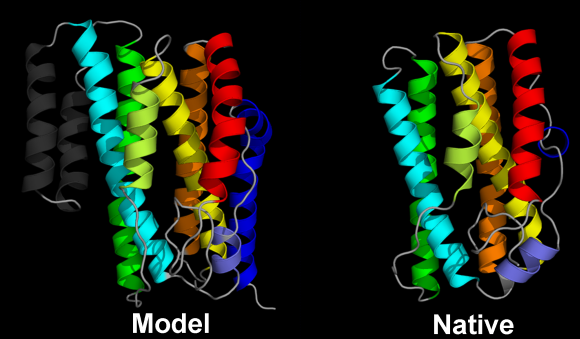 Our modeling appeared to be very successful and predicted correct protein topology and reviled the structure of regions which were not present in a crystal structure of native protein. 2. Joint Center for Structural Genomics (JCSG). Crystal structure of putative tRNA-(ms(2)io(6)a)-hydroxylase (NP_744337.1) from Pseudomonas putida KT2440 at 2.05 A resolution. To be published. 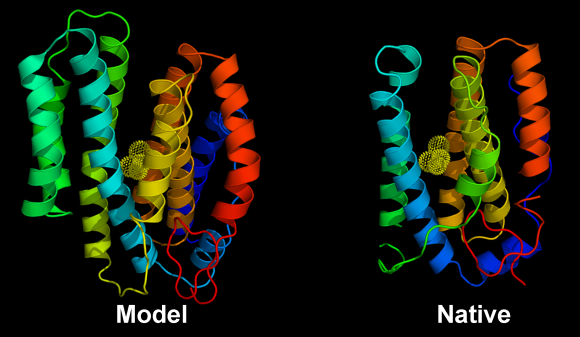 Comparison of structures of our model and the native structure (PDB code: 2ITB). 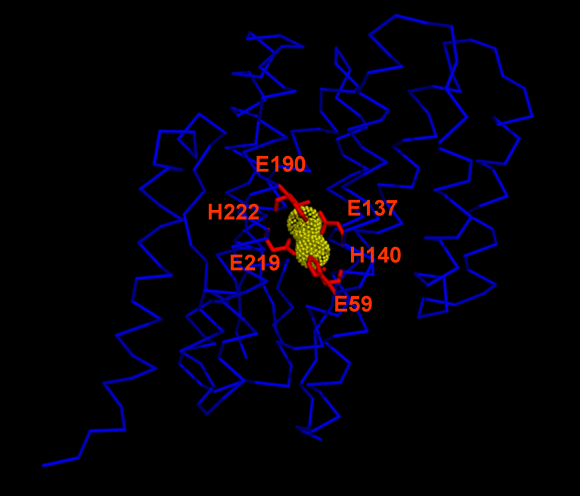 Structures are colored according to the sequence index (N-terminus - blue, C-terminus - red). The model is of very good quality in regions of catalytic core. Regions with corresponding secondary structure elements are colored in the same way. The structure of regions which were not present in native protein are colored in a dark gray. Correctly predicted and functionally important residues of StMiaE. The diiron cluster in StMiaE is shown as gold spheres. Catalytic residues (E59, E137, H140, E190, E219 and H222) are colored in red.